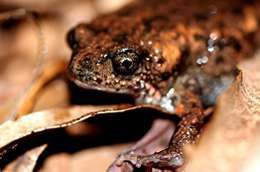 (PhysOrg.com) -- A new miniature frog species or toadlet has been discovered in the resource-rich Pilbara region of Western Australia, an area previously thought to support very few of the amphibians. Researchers from the Australian National University, the Western Australian Museum, and the University of Western Australia have used genetic techniques to show more species of frog are present in the Pilbara than previously thought. Lead author and PhD student from the Research School of Biology at ANU, Renee Catullo said the findings included a species previously unknown to science. The deserts of Australia are often believed to be empty regions with few species. However genetic work on reptiles and amphibians has shown that there are large numbers of species in what looks like a barren landscape to most people, she said. We have also identified a new species of burrowing frog called the Pilbara toadlet (Uperoleia saxatilis), which is just over two centimetres long. Little is known about this small, brown creature but it has been found following cyclonic rains and occurs in rocky gorges and creeks of the region. The good news is that it appears to be secure from a conservation perspective. The discovery was part of a research project funded by the Herman Slade Foundation that uses genetic techniques to try and understand the true number of species of toadlets. Genetic techniques are increasingly being used to identify new species across Australia that use calls, pheromones, or behaviour to tell each other apart, Ms Catullo said. In these cases genetic techniques can tell us which groups are interbreeding, even when its hard to visually differentiate them.